The D Programmes - Kids TV - Classic programmes from yesteryear. 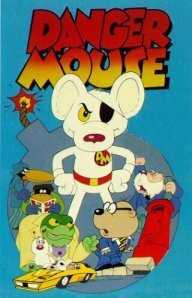 Dangermouse : Colonel K would give Danger Mouse and Penfold (now confirmed as being a mole), who said "Ooh Crickey" a lot, a mission against the evil Barren Greenback (asthmatic frog, no relation to Gabriel the frog in Bagpuss OR Alberto, the conductor in Bod) and his henchman, a Mexican crow, Stiletto ("See Baroni") and a ball of fluff called Nero. DM lived in a pillar box and had a cool yellow car that could turn into a plane. The programmes catchy title included a large number of cannon ball type bombs making the title music very dramatic. Voices provided by Terry Scott (June!) and David Jason. The BBC are to repeat all the Dangermouse episodes to celebrate the 25th aniversary of the programme. Whether this will mean a dip into the rest of Cosgrove & Hall's work is unknown. HE'S THE FASTEST, HE'S THE BRAVEST, HE'S THE BEST. Data Run : Saturday morning fayre from "Good Morning Britain". Girl "inside" a talking computer. Kids TV in the morning before they found Roland Rat! 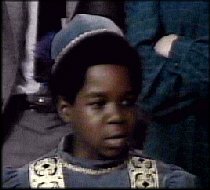 Different Strokes : Ah, Gary Coleman. He was only 13 when he stared in this and he was only 3ft tall! Plus Willis, Dudley, Kimberly and Mr Kimberly's dad. Rich bloke takes in black kids and lots of race / colour based morality hilarity ensued. "What you takin' 'bout Willis". MAY NOT BE RIGHT FOR SOME. Dizzy Heights Hotel : A "madcap" hotel owned by a "madcap" family. Eustus, the big-cheeked son, did most of the work around the place, two mice lived under the stairs and the stuffed heads of a boar and a moose used to argue with each other Statler and Waldorf style. Doctor Snuggles : Snuggles was an inventor who rode a talking umbrella/pogo stick with a ducks head on it.It's name was Jefferson. He lived in a house with a skinny old lady named Ms.Nettles.The good Doctor had many friends some of which were Dennis the badger,who helped Doctor Snuggles build stuff,.Knobby Mouse who was always making trouble and needed his mousebutt kicked and Grannie Toots who ran the Cat Hospital.Of course there are many,many more characters! YOU AND YOUR MANY MACHINES. Dogtanian and the Three Muskerhounds : From the people who made Willy Fog, More animals playing famous characters, I'm sure this one had a mouse as well but I don't know if it was any relation to Teeko in Willy Fog. The Double Deckers: A red London Bus which was made into a kids camp/den. One of the kids was really fat and called doughnut and I think one of the lead girls was called Billy. The young girl "Tiger" owned a tiger! At the end of the theme tune at the end of the show they would all sing "See you next week" and all wave!! Dungeons and Dragons : Based (very loosely) on the board game I suppose. Six kids from Earth are transported to a strange land where they meet a unicorn ("Uni", please) and the dungeon master. Little dungeon master would leave them a message and then bugger off sharpish before the bad guys, Venga, Tianat and the shadow demon arrived. He never told them the way home. Once, they did make it back, only for Venga to follow them, forcing them back into the D&D universe. Eventually they did make it back, time had not moved on in their absence and they just finished the Dungeons and Dragons ride as though nothing had happened. No dice were involved in the making of this programme.